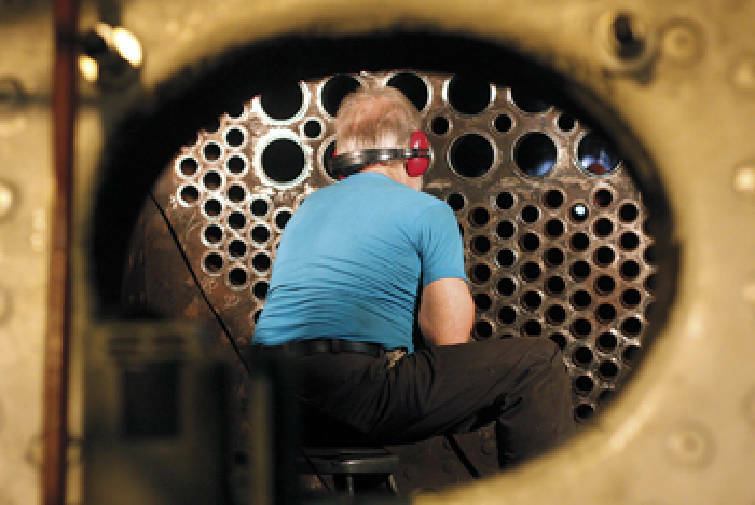 Staff Photo by Allison Carter/Chattanooga Times Free Press - Allan Phillips beads the end of the boiler tubes over in, the Southern Railway 630, a steam locomotive, that is being restored for passenger excursions later this year. The Tennessee Valley Railroad Museum teamed up with Norfolk Southern to rebuild and restore three steam locomotives as a part of hte "21st Century Steam" program. If all goes according to plan, railroad excursions on a 106-year-old coal-powered steam locomotive could begin later this year as part of an agreement between the Tennessee Valley Railroad Museum and Norfolk Southern. The two railway entities are hammering out details on a "21st Century Steam" program that would highlight milestones in rail history through locomotive event appearances and passenger excursions. The program is to feature three steam- engine trains that will be rebuilt to meet Federal Railroad Administration standards. "Our shop is going to be very, very busy," said Tim Andrews, TVRM executive director. Southern Railway 630, built in 1904 and later donated to TVRM by Southern Railway, now Norfolk Southern, has been in the TVRM shop for the past six years undergoing an extensive rehabilitation and refurbishing process. Work on the train should be complete in the next couple months, Andrews said, and the locomotive is slated to be the first to run in the 21st Century Steam program. After work is finished on the 630 train, Southern Railway 4501 - the largest of the three locomotives, with 63-inch driving wheels - will go in the shop and should be ready to run within a year. Last in line for a makeover will be the Tennessee Valley Railroad 610, which is currently being used for weekend and special holiday excursions and was most recently featured in the filming of "Water for Elephants." * Southern Railway 630: Built in 1904, the locomotive traveled throughout the Southeast before it was donated to the Tennessee Valley Railroad Museum. It has been undergoing an extensive rebuilding for the past six years and should be ready to be the first train to run in the program later this year. * Southern Railway 4501: Built in 1911, the train was in freight service in Tennessee, Virginia, Kentucky and Indiana before it was sold to a short line railroad. This locomotive is the largest of the three, with 63-inch driving wheels. * Tennessee Valley Railroad 610: Built in 1952, the locomotive has been in service at the TVRM since 1990 and was part of the museum's steam excursions in the early 1990s. One of the last steam locomotives built in the U.S., the train is currently being used for weekend and special holiday excursions before it goes into the shop to be refurbished. Andrews said the details of the program are still being worked out, but it will provide "an opportunity to educate the public on the train's role in today's economy." Officials at Norfolk Southern said they expect to have an agreement and excursion schedule soon. Rick Harris, a Norfolk Southern spokesman, said the company is "very excited about the program." Steam engines were mostly taken off the rails in the 1950s and 1960s, he said, when diesel locomotives became popular due to their ease of operation and cost efficiency. To Andrews, diesel-powered trains "are fairly plain" when compared to coal-powered steam locomotives. "There's a certain magic to a steam engine," he said. "It's almost kind of a romantic thing, like you're going back in time. It just has an aura that's different." Up until the '90s, TVRM hosted several excursion programs which would draw crowds of up to 1,000 passengers, Andrews said. By once again offering such a program, he said he's hoping the museum will be provided with "resources to accelerate the rebuilding process" so that restoration on the remaining engines in the program will take less time than work on the first took. Bob Doak, president and chief executive of the Chattanooga Area Convention and Visitors Bureau, said train excursions are popular in Chattanooga since it's a city with a history in the railroad industry. "They're really good, these excursion trains," Doak said. "And people here love trains. A questions we're asked a lot is, 'Where can I ride a train?' So this will only add to the appeal Chattanooga has to visitors."